Though parking on the footway in London has been banned for 40 years, it has been tolerated by many councils throughout the country. It is illegal to drive a motor vehicle on or over a pavement or footpath except to gain access (RTA 1988, Section 34), so this has been a grey area for 29 years. How do you park on a footway without driving onto it? But councils have generally turned a blind eye. Now, however, the Local Government Association (LGA), is asking councils to clamp down. The group, which represents 370 English and Welsh councils, says local authorities should be stopping drivers from parking their vehicles on kerbs, paths and verges. If the rules change, you could find yourself with a parking ticket and an expensive fine. Councils can already fine you if you cause an obstruction or leave your motor next to yellow lines. However, if the suggested new rules are enforced, it could mean many people getting caught out. Councils will likely be able to decide for themselves how much their penalties for pavement parking might be, but you’re probably looking at between £50 and £70. Similar to general parking fines, these will be reduced by 50% if paid within 14 days. A spokesperson for the LGA has said the money made by the fines could go back into repairing roads. It remains to be seen how the residents of one Victorian Surrey street pictured below will manage because there is nowhere else in the vicinity capable of providing parking for their cars. The local village pay carpark is already jam packed. Many thanks to the Tradesure newsletter. If a car is obstructing the pavement such that a wheelchair or buggy has to use the road then quite right they should get a ticket. Agree with last post, but if two wheels on pavement were banned around the country either the courts will have a 10 year backlog or traffic will grind to a standstill, or both! There are plenty of situations where it is more sensible to park partly on the pavement where the road is thin and the path is wide - surely common sense should take control of these situations, where there is obviously not enough space for people to pass, those should be taken care of. 2) ensure that should an emergency vehicle (ambulance or fire engine) require access this is not restricted. I do NOT support lazy arrogant motorists who just park on the kerb for convenience because they cannot be *rsed to walk a few extra yards nor those who obstruct the pavement meaning that wheelchair access, and even standard pedestrian, access is severely impaired. If a blanket policy of fine everything is introduced there will be chaos. If councils want to allow parking partly on the pavement they should paint a 'limit' line on the pavement which would ensure there was still space on the pavement for the unobstructed movement of pedestrians. This marking would clearly define when a parking charge (or obstruction charge) would apply. Pavement parking should be banned altogether. Blind people must be able to walk freely on the pavement without having to negotiate around vehicles. The Guide Dogs for the Blind Association is campaigning for a ban on pavement parking except where it is permitted by the local authority. This could be a compromise between Derek's position and some of the opinions expressed above. 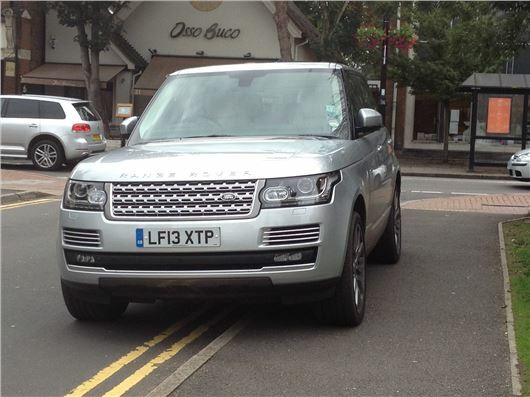 In situations like that shown in the photograph a strictly regulated degree of pavement parking - up to a white line, leaving sufficient width for pedestrians (wheelchairs etc) could be permitted. However in many of our urban areas - e.g. 1950s housing estates where virtually everyone has a front garden large enough to park at least two cars - there should be an absolute ban. Try to take a walk around one of our post-war housing estates and you'll struggle to stay on the pavement - you'll be obstructed by vehicles parked on the pavement, some across the entrance to the owner's empty driveway. Still others will be parked on the pavement within a few feet of a perfectly usable space on the road. Much pavement parking arises out of laziness, thoughtlessness and bad habits. Users of a skateboard ramp near my home block the pavement with their cars, forcing pedestrians on to a busy main road. Surely they are fit enough to park in a nearby side street and walk a short distance?! Repeated parking on pavements also causes cracking and misalignment of paving stones and no council is ever in a rush to repair them, so let's keep them intact! Good news but will it be enforced? Probably not. We have a driving school car collect and drop off a student in our street and each time the car stops with two wheels on the pavement. What sort of example is that to someone learning to drive?